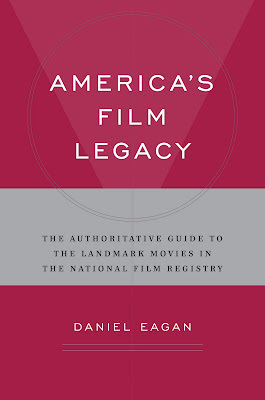 Two new 33 1/3 volumes are just publishing, that we'll be telling you about very shortly - in the meantime, you might want to hear about our new release America's Film Legacy: The Authoritative Guide to the Landmark Movies in the National Film Registry, by Daniel Eagan. "The opportunity to revisit and be inspired by the past is one of the purposes behind the National Film Registry. The 1915 film The Italian was preserved from a single paper copy. If prints were readily available at the time I made The Godfather, I would have enjoyed having access to it. I'm proud that The Godfather and The Godfather Part II join The Italian on the Registry, an attempt to preserve our cinematic heritage. America's Film Legacy doesn't just explore the films on the Registry, it ties together the past and the present, showing how the great movies of today can be built on the those of an earlier era." "America's Film Legacy is a brilliant, insightful and invaluable breakthrough book which makes American film history and the men and women --both the legendary and the all but unknown--who created it, come to life in fresh and vivid detail. This superb book offers a startling and wise appreciation of the essence of their film achievements." Robbins Barstow, 1956. Sound, color, 1.37. 35 minutes. Featuring: Robbins Barstow, Meg Barstow, Mary Barstow, David Barstow, Daniel Barstow. Credits: Filmed, Directed, Written, Edited, and Narrated by Robbins Barstow. BTA Films & Video, Wethersfield, Connecticut, USA. Additional credits: Sound and narration recorded in 1995. Available: Internet Archive, www.archive.org. Contact Robbins Barstow at RobbinsB@aol.com. Born in 1920, Robbins Barstow started making movies at the age of twelve, “family chronicles, travelogs, and other documentaries,” as he wrote to blogger Cory Doctorow in 2008. In 1936, he filmed Tarzan and the Rocky Gorge, a twelve-minute fiction short starring himself, two younger brothers, and three neighbors. He was by that time a member of the Amateur Cinema League, and a devoted fan of Hollywood movies. Given the problems with available equipment and amateur acting, Robbins’ Tarzan short shows a sophisticated understanding of camera angles and composition, structuring scenes, and editing. In a biographical essay, he wrote, “All my life I have had two primary aims in my movie and video making: create meaningful records of people, places, and events; and to share these ‘moving images’ with other people. I edited my films to make them meaningful, and I projected them to limited, on-the-spot audiences, in homes or auditoriums, to share them.” Barstow also married, raised a family of three, and worked for thirty-four years as director of professional development for the Connecticut Educational Association. Disneyland Dream, which features Barstow along with his wife Meg and children Mary (eleven at the time), David (eight), and Danny (four), came about as the result of a 1956 contest sponsored by 3M’s “Scotch Brand Cellophane Tape.” Every family member entered the contest, with Danny’s entry winning one of twenty-five grand prizes, a week’s vacation at Disneyland. In Disneyland Dream, Barstow provides an amusing narrative frame for the trip, documenting the submission of entries, how family members “fainted” on learning of Danny’s win, and their flight from Connecticut to California. He employs tricks like reversing footage, using stop motion, and inserting associative footage like fireworks into the storyline. Throughout the film he is an indefatigable performer, with his wife and children enthusiastic accomplices. The film displays many of the characteristics and some of the drawbacks to home movies. Barstow’s handheld, 16mm camera cannot record scenes as clearly as more expensive equipment, especially without the support of tripods and dollies. He did not have the luxury of pre-planning many of his shots, was not able to film second or third takes on location, and had to use existing light. The opening scenes at the family home in Wethersfield, Connecticut, where Barstow was able to control his actors and settings, and stage written scenes, are more carefully composed and photographed than the later Disneyland material. Most home movies share some key elements. Due to the nature of the equipment--the time it takes to set up, for example--home filmmakers tend to gather their subjects in familiar tableaus. Around the Christmas tree, exiting the front door, entering the car, seated around a picnic table. Few filmmakers proceed beyond these initial points, because they are just recording their families, not involving them in stories. Also because the equipment prevents them from taking part in the festivities they are filming. Another staple of home movies is modes of transportation. Arrivals and departures, by car, train, bike, boat, or plane, may account for more footage than blowing out candles on birthday cakes. Disneyland Dream has its share of tableaus and tarmacs, but Barstow graces them with a point-of-view and an understanding of how to shoot and put together scenes. He was also lucky enough to visit Disneyland when it was only a year old, in fact not entirely completed. At the time, the Disney staff made its own films about the amusement park which have recently been released through the Walt Disney Treasures series. Bright and professional, they are like Hollywood product, promising beauty and excitement. Barstow’s film gives a much better approximation of what the Disneyland experience was like for an average tourist. Barstow continued filming in 16mm until 1985, when he switched first to 8mm and then to video. The new processes enabled him to record live commentary (and were considerably cheaper). While converting his old 16mm stock, Barstow was able to add soundtracks and narrations. Over seven decades, he has amassed more than one hundred amateur video productions, which he has shown to church groups, historical societies, and a growing number of film organizations, including Northeast Historic Film (www.oldfilm.org) and Home Movie Day (www.homemovieday.com). He has also donated twelve of his works to the Library of Congress. And you can watch Disneyland Dream right here. It's probably worth mentioning here that both Barstow's teenage Tarzan movie from 1936 and the sequel he made in 1974 when he and his brothers were all 50 are covered in-depth in Continuum's book about the history of 'fan films,' Homemade Hollywood: Fans Behind The Camera. I might want to hear about your new release America's Film Legacy: The Authoritative Guide to the Landmark Movies in the National Film Registry, by Daniel Eagan. Coming in at 832 pages, it's a monster of a book and is one of the most magisterial works You've ever had the honor of working on. It consists of 500 essays - one about each of the films in the National Film Registry. A wonderful book to dip and and out of, or to read straight through. nice info about disneyland dream..
like he say : All my life I have had two primary aims in my movie and video making create meaningful records of people, places, and events; and to share these ‘moving images’ with other people.